In a penalty kick situation, goalkeepers must decide what to do before clearly observing kick direction. Basically, goalkeepers feel worse, and are judged more harshly, if they stay in the centre and fail to stop the ball than if they jump left or right and fail. Another profession that exhibits action bias, and for much the same reason, is politics. 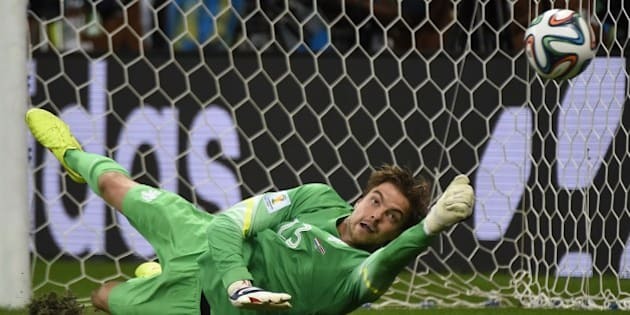 As hundreds of millions of World Cup fans around the globe are well aware, penalty kicks are extremely important. They often determine who wins or loses, as they did in the penalty shootouts in the Round of 16 that saw Brazil eliminate Chile, and Costa Rica eliminate Greece. Given how much is riding on the outcomes of penalty kicks, one would expect highly-paid elite goalkeepers to adopt the best possible strategies for ensuring their teams' victories. But according to a study by Israeli Professor Michael Bar-Eli and his colleagues, they do not. In a penalty kick situation, goalkeepers must decide what to do before clearly observing kick direction. As it turns out, although they face kicks that are directed left, right and centre in roughly equal measure, they are far more likely to jump left or right than they are to stay in the centre of the goal. In fact, of the 286 penalty kicks examined in the study, goalkeepers stayed in the centre only 6.3 per cent of the time. This is all the more surprising given that when they do stay in the centre, they are about twice as successful, stopping one third of kicks versus less than one sixth when they jump left or right. Of course, if goalkeepers always stayed in the centre, kickers would stop kicking there. But at the very least, they should stay in the centre a lot more often than they currently do. What explains their less-than-optimal behaviour? The reason given by the authors is something called "action bias." Basically, goalkeepers feel worse, and are judged more harshly, if they stay in the centre and fail to stop the ball than if they jump left or right and fail. This is because jumping feels like an action, whereas staying in the centre feels like inaction, and they are expected to act. Better to risk failure by "doing something" than by doing nothing, even if doing nothing is the better option. Like other economists have noted another profession that exhibits action bias, and for much the same reason, is politics. After a plant closure, or a spike in unemployment, or an economic downturn, politicians predictably jump to the left or the right in order to be able to say that they did something. Doing nothing is rarely considered -- and often judged harshly by voters when it is. Take the response of governments to the 2008 financial crisis. When the U.S. housing bubble burst and the ensuing crisis rippled through the global financial system, the American government responded with monetary and fiscal stimulus, bailing out banks and automakers deemed too big to fail. Governments around the world followed suit, taxing and spending and printing money. The Canadian government was initially skeptical of this approach, and for a while appeared prepared to bite the bullet and do nothing. However, faced with criticism from the country's three opposition parties for not including a stimulus package in their fiscal update--and a plan to introduce a motion to topple the minority government -- the Prime Minister infamously prorogued Parliament. When the dust cleared, the government had committed itself to an Economic Action Plan that included tens of billions of dollars of stimulus. If our politicians had stood fast in 2008, and if their counterparts around the world had similarly resisted the urge to jump, perhaps we would be in the midst of a boisterous recovery instead of an anemic one. In response to the Depression of 1920-1921, U.S. President Warren Harding avoided implementing any kind of stimulus plan. In fact, it actually reduced both spending and taxes. Instead of doing something, the government stopped doing so much, and the recovery was quick--so quick that many have never heard of this episode in American history. In contrast -- and contrary to popular opinion -- Herbert Hoover intervened in the economy in many ways after the stock market crash of 1929, first raising spending, and then hiking taxes to try to get his unprecedented peacetime deficits under control. And of course, FDR -- who campaigned against Hoover's reckless spending -- doubled down on his predecessor's stimulus policies. Thanks to both of them, the Great Depression dragged on for many years, and things did not really pick up until after the end of the Second World War. Yet we ignore the lessons of history showing the benefits of doing nothing and the costs of doing something. We keep calling, as the head of the IMF did this spring, for more and bolder action to boost the weak global recovery, despite the fact that it is governments' bold actions that have kept the recovery weak. We keep calling upon our politicians to jump, when we'd have a better chance of stopping the ball if they just stayed put.